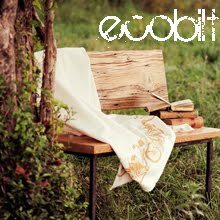 Pure Green: New Book: Ecoholic Home! Yay! I've been looking forward to this book for MONTHS! (It has nothing at all to do with the fact that my little store, Sustain, is in it!!!! Okay, okay, its just a little mention, but still, its an international bestseller! Check out page 346!!!! Ahem, pardon my excitement.) 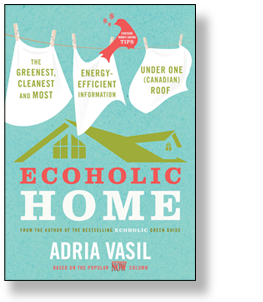 Here's how Adria describes her book: 'Ecoholic gives home owners, renters, condo-nesters and even dorm dwellers all the most up-to-date Canadian product and service info you need to eco-fy your private space - all the while pocketing planet-friendly cash savings. So stop stewing in toxins, chucking energy out the window and feeding the trash treadmill, and start transforming your abode into an Ecoholic haven!' This sets the tone for the book - you can imagine how great it is. Just a note: while this book is useful for everyone, it is really best suited for Canucks, as its full of resources just for us. This is such a great idea. I love the fact that so many people are deciding to go green. Thanks for all the tips!